Pedalear en inviernos duros: ¿Un buen plan o es una locura? (En inglés) - Bicivilizados. Ciclismo urbano. Alegría entre tus piernas. “You need some padded, insulated gloves, a good warm hat, good warm socks to keep the extremities of the body warm. And one of my favourite pieces of gear is a wool long-sleeve shirt that I’ll wear underneath a sweatshirt,” says Dave Currie, master mechanic at Mountain Equipment Co-op in Toronto. And he says breathable, waterproof outer layers are the key to staying dry. It gets dark out earlier, so lights and reflective vests are a must. “I wear a black winter coat. It’s stylish, I like it, but it’s black. So I wear a safety vest over top of that — I’m doing my part to be a bit more visible,” says Bambrick. Currie suggests changing from smooth to “knobby” tires. And studded tires are great for cities that get a lot of ice, something Kanigan in Yellowknife and Babin in Calgary use. 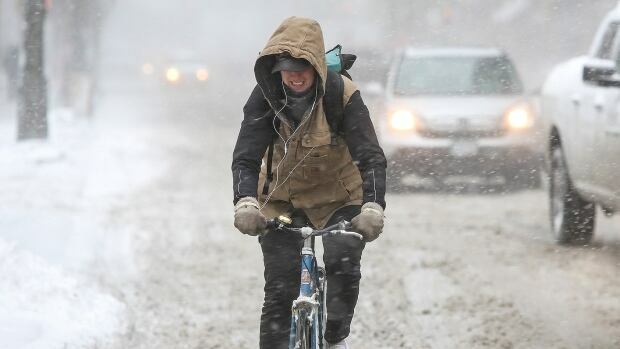 Bambrick suggests practising braking and turning in the snow before tackling a full commute. Instead of cycling on your main summer route, Bambrick and Currie suggest taking roads that are less busy. It can be more difficult to stop if the road is wet, so Bambrick says cyclists should take their time. Summer cyclists usually get a tune-up once a year. 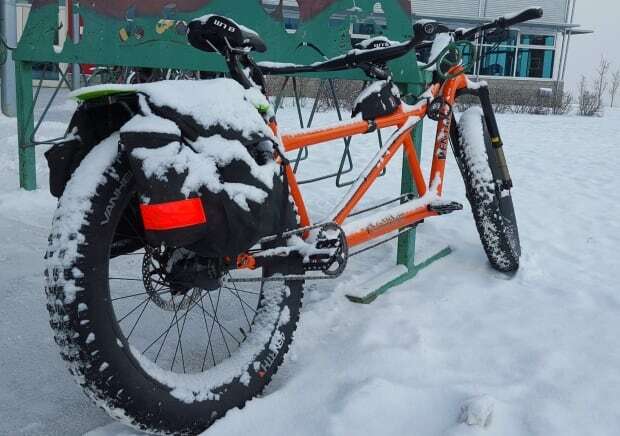 Currie suggests year-round cyclists tune up every few months because winter can be tough on bikes. Some, like Babin and Bambrick, use a “beater” bike (albeit a well-functioning one) for the winter. “I always say, there’s no need to be a masochist about the whole thing. You don’t have to ride every day,” says Babin. Even he doesn’t ride in some conditions. Bambrick, Babin and Kanigan all avoid cycling in freezing rain or on days with heavy snowfall.